The Battle is upon us. That’s right, folks. 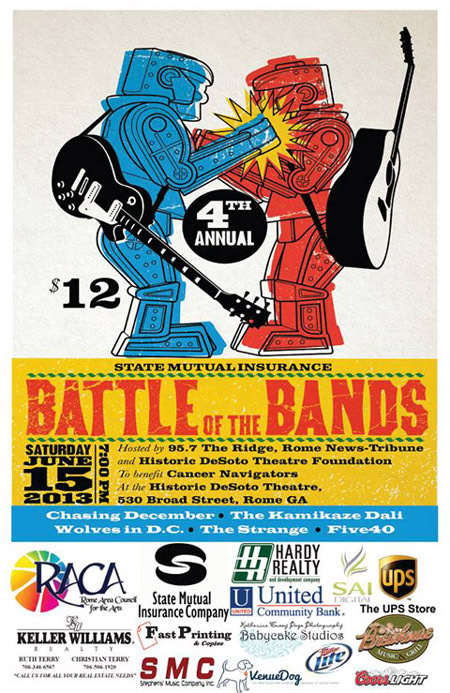 Step right up and witness the final five contestants of the 4th Annual State Mutual Insurance Battle of the Bands duke it out in front of a live audience. Tickets are only $12 and 100% of profits go to Cancer Navigators. The Battle is brought to you by 95.7 The Ridge, Rome News-Tribune, The Historic DeSoto Theatre Foundation, and more (check the poster). The bands are all sounding pretty dang good and I’m sure they will all bring their A-game. We got Five40, The Kamikaze Dali, The Strange, Wolves in DC, and Chasing December. Here’s how you can order your tickets now! See you there. Posted in Uncategorized | Comments Off on The Battle is upon us. You are currently browsing the The Rumpus Compendium blog archives for June, 2013.